Everybody is a leader. A daddy is the leader of his family. A Form teacher is the leader of his class. A club chairman is the leader of a club etc.. Therefore, leadership is an issue of everyone. Many people would agree that leading people is never easy. Yet, fortunately, leadership can be learned. One can be a better leader if he knows what a leadership is concerned. According to Peter Drucker, a leader is not a manager. A good leader is not only about the skills or ability but also about the characters. Great leaders lead by such virtues as magnanimity, humility, prudence, courage, self-control and justice (the latter four is known as the cardinal virtues). Characters can be nurtured. Leadership is thus a life-long learning journey. It is not static like management but a dynamic process interacting with followers. Another famous world leaders’ trainer, John C. Maxwell, explains that there are five levels of leadership. The higher level a leader goes, the easier it is to lead others. But there’s no easy way to get to the top. Leaders add a new level to the previous one. It is a building process. Nobody achieves anything great by giving the minimum. Furthermore, leaders do not lead everyone the same way because every person is different. 1. Level 1: Position Level is the entry level of leadership. The leaders lead due to the job title. They rely on rules, regulations and policies to control their people. They have no influence. 2. Level 2- On the Permission level, the leaders get to know their people and build relationship with them. When the leaders like his people and treat them as individuals who have value, there develops mutual trust. The leaders begin to develop influence with the followers. One cannot lead well without liking them. 3. 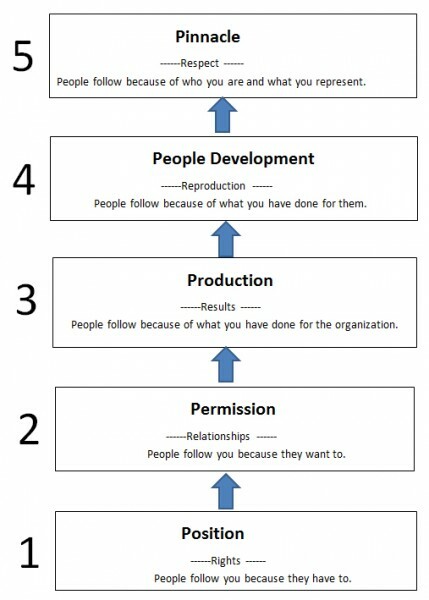 Level 3- On the production level, leaders become change agents. Good leaders don’t just create a pleasant environment, they get things done. Work gets done, morale improves and goals are achieved. They can take people to another level of effectiveness. 4. Level 4 – People Development: Leaders become great because of their ability to empower others. They use their position, relationships and productivity to invest in their followers and develop them until those followers become leaders in their own right. Teamwork goes to a very high level and deepens relationships. As there are more leaders on the team, the performance increases. 5. Level 5 – Pinnacle: This is the highest and most difficult level of leadership. Level 5 leaders are willing and able to develop other leaders to become Level 4 leaders. Their leadership gains a positive reputation. They create legacy in what they do. True leadership is not generated by the title. A leader must be able to inspire and develop followers. A leader builds a team that produces not only results or performance, but also future leaders. If you are a leader now, do you know which level you are? Strive to the next level and the highest level! God bless.